Jim Meehan | PDT (Please Don't Tell) - Find. Eat. Drink. 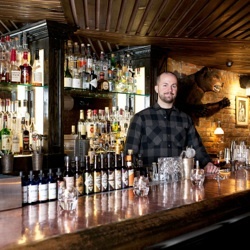 Jim Meehan’s recommendations for what to drink and where to eat, drink and shop in New York, Boston, Chicago, Miami, New Orleans, San Francisco, Los Angeles, and Seattle. Mixologist and managing partner of PDT (Please Don’t Tell). 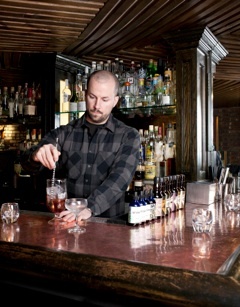 Innovative and influential master barman, recipient of the Spirit Award for American Bartender of the Year. In the ever-expanding world of cocktails and their recent revival, Jim Meehan is a name often exploited. Yet he could arguably be characterized the same way one reads a historic figure from a bygone era: Connoisseur. Bon vivant. Legionnaire. Zealot. Philosopher. Epicurean. Aesthete. Lawman. Faith healer. Trapeze artist. Hustler. Pimp. Rock Star. Yet when one reads his name in print, “mixologist” is the word often used to categorize him. Mr. Meehan, however, is far too humble to accept this word into his lexicon. Ask Jim Meehan who he is, the answer is what it’s always been in his eyes: bartender. Since he’s been in New York, Jim Meehan’s bio reads like a stepladder. He’s worked at Five Points, Pace, Gramercy Tavern, Pegu Club and, now, PDT (short for Please Don’t Tell), the internationally-renowned, wildly successful cocktail bar he’s been a part of since they opened in 2007. Recently, I had the good fortune of sitting with Jim and discussing the world of bartending through his work regiment and finding some insightful wisdom from a fellow bartender and good friend. Q. So how did this young scrapper from River Forest, Illinois, get to be such a renowned bar figure? A. I was a college freshman in Madison, Wisconsin. I knew that I didn’t have enough money to stay in school without working, and my buddy Andre was a bouncer at State Street Brats, so he helped me get a job. I left Brats for Paul’s Club, where I spent the rest of my Madison career, before departing for New York City. My passion level for bartending was very high in Madison and I simply wanted to expand that in New York. Q. You’ve been heavily involved in the new classic cocktail movement for the past five or so years. When did this new attention to cocktails start influencing you? A. I really got involved at Pace, working for Jimmy Bradley and Danny Abrams, and after I started there, one of my cocktails made it into Bon Appetit’s ‘Best Cocktails of the Year’ issue. Shortly thereafter, I went to Milk and Honey for the first time and had a drink called the ‘Gold Rush,’ which opened my mind to the world of cocktails in a whole new way. Q. So you had this newfound passion to spark the fire. A. But the funny thing about that is, I think all bartenders – whether you’re passionate about cocktails or not – are opportunistic people. So I saw an opportunity to approach bartending in a different way, and it was exciting. Q. And the bar that you run has the potential to expand on that? A. The bar is a trendy place, and things come and go out of style all the time. Cocktails in pint-size plastic cups, micro-brews, single malt scotches, small batch bourbons, and St. Germain, etc. These are all trends. And as a bartender it’s our job to know about them. It’s akin to being a fashion designer. We need to be thinking about the next season. Q. You helped open PDT after the success of Pegu Club, which was a big part of the beginning in our current cocktail revival. What were some of your early obstacles when PDT opened its doors. A. One thing that definitely helped when we opened PDT was being a small bar in the new economy. We had many ideas to try and be innovative. For example, chefs were doing their own hot dogs and we parlayed their ingenuity toward our food program. PDT is affiliated with Crif Dogs (the hot dog restaurant connected to PDT’s entrance), and Brian Shebairo, the owner of PDT and Crif Dogs, celebrated this kind of growth. Q. It helped to be proactive with the menu too. A. Exactly. We put out entirely new menus each season in the beginning, and eventually scaled back to rotating blocks of new drinks on a monthly basis. I think that’s so important when opening a new place. Be open to change. We changed the lighting, the tables, the color of floor, the glassware, and all those details needed room to grow. Q. What’s a day in the life for you at PDT? A. I make daily reservations for industry friends and peers; handle ordering, write the menu and buy all the booze; I hire and fire; oversee training; handle public relations and book all the private parties. Often times, I’m the one that goes to the greenmarket and picks up the kimchee from Momofuku for our Chang Dog and goes to WD-50 for mayo sticks for the Wylie Dog. Q. Wow. That’s heavy, brother. Q. Given the recent resurgence of cocktail lore and how the publishing world has taken to the books, publishers such as Mud Puddle Books have done a terrific job re-distributing the forgotten classics, where we find the bartenders of the late 1800s through Prohibition really taking their position to a new standard. When training staff, what’s your educational emphasis? A. I usually recommend The Joy of Mixology, by Gary Regan, first and foremost. Gary is the everyman each bartender should know and revere. He has incomparable foresight and is always looking at new designs. He was making orange bitters when no one was making them. He’s a great role model, writer and educator. Q. He’s very observant, too. Coming from a time in New York when Gary, Dale DeGroff and later, Audrey Sanders (from Pegu Club), were pioneering the movement, now they’re everywhere. Gary’s book is so deft at capturing the new inspirations we see taking shape in and around bars. A. I have spoken to or emailed Gary, Audrey and Dale within the last two weeks, and yesterday alone, I talked to a lot of different people who are far younger than me who are getting very interested in cocktails, and I see what I’m doing these days reflecting less about ‘mixology’ and more personal relations. I’m no longer tending bar regularly at PDT. I was originally hired as a consultant before I took the general manager position. I know I can mix drinks. What is much harder than mixing drinks is mixing people. After I started at PDT, what I’ve spent far more time working on is mixing people. I had the fortune of working at Gramercy Tavern within Danny Meyer’s standard of hospitality and that’s inspired me to incorporate similar structure with my staff. The cocktail knowledge has been vast and valued, but what I’ve really learned from Dale, Audrey and Gary is how to treat people, ethically and personally, from staff to friends. As a bartender, personality is part of our job. Q. Does that influence how serious bartenders approach their positions today? A. No. When we opened Pegu Club, no one had the information. Dave Wondrich had Esquire drinks and Dale had The Craft of the Cocktail and Vintage Spirits was out, but extensive background information was limited. And it was out there, but it was in a lot of rare and out-of-print books and a lot of expensive antique books. But now the USBG (United States Bartenders’ Guild) has a master mixology program, there’s B.A.R., there’s Bar Smarts, and there are plenty of bars where there’s at least one guy with extensive training and influence, and nowadays there’s more access to great recipes. Five years ago, there wasn’t. Right now, it’s more about how that knowledge is implemented, and the execution of programs, but more than that, it’s about insisting upon integrity. Q. Having regularly traveled as a cocktail consultant the last couple years, do you see the integrity noticeably missing on an international scale? A. Internationally speaking, I am very inspired by the restaurant industry. In few other aspects of hospitality do you find such warmth, humanity, passion and intelligence. Thanks to places like the Food Network and various food media, we have this newfound level of interest – and it’s a very acceptable social medium. What I am concerned with, is when I train people on cocktails, and I’m making someone a drink with El Tesoro tequila, and the people who haven’t gone out to sample various products in bars and restaurants try El Tesoro, and they think something’s wrong with the flavor, when what they’re trying is actual tequila! On a consumer level, that worries me. You know? When the local ‘Cheesies’ is serving their high-end margarita with a poor tequila, that concerns me. It’s important that people understand what tequila tastes like. One of the biggest challenges for the cocktail world is reaching the consumers. We spend a lot of time talking to one another when we should be bringing more people into the fold. Q. So is there a way of incorporating that dialogue into the exchanges one can make bartending, say, at a cocktail bar such as PDT or Pegu Club? A. Mise en place is crucial to that. Our PDT bar is set up like a station in a kitchen. What I find when I walk into most bars in the world is they are not set up to make cocktails. 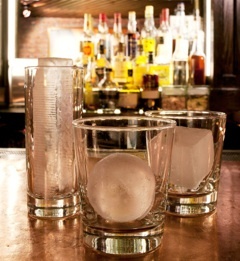 If you set your bar up effectively, you have more time to chat with guests about the drinks you’re preparing for them. Q. Speaking of cocktail books, you have one coming out next year. A. Yes! Very exciting. As I’ve joked before, however, I bring new life to deadlines. Q. Will the book reflect anything specific about bar design? A. From the beginning, yes. A friend introduced a friend: Keith Geldoff, who teaches in technical drawing design at Parsons. I had him sketch the bar at PDT. There hasn’t been a cocktail book released in the last fifty years with an entire section devoted to bar design. The goal of the book is to lay it all out there. Every recipe we’ve ever served at PDT; the design; the philosophy; the information about the spirits, etc. I truly believe there’s an art to running a place – and each place is different. Q. What’s the intended goal for the book? A. I think the book will be great for people who have worked their whole life behind a bar and, conversely, it will provide information to those just getting started and looking to grow. All they need is the information. Q. How do you go about hiring your staff? A. I look for a diversity. I’ve hired staff born abroad, born and bread New Yorkers, and many without bartending backgrounds. A mixture of different people creates the right chemistry for me. Hiring is the most important part of what I do. Q. In addition to your consulting, what else has been keeping you so busy? A. I’ve been working with the B.A.R. partners to help produce this great project called Bar Smarts, a program funded by Pernod Ricard USA. We hold the program in cities all over the US. Bartenders, distributers (and some managers and owners) in each city are invited to participate in a certification program, culminating in a live event where their knowledge of mixing techniques and spirits production methods are tested. Q. Which is what people like Jerry Thomas – who wrote the first bartender’s manual in 1862 – were covering back in the late 1800’s. Q. As in food culture, trends in how and what we drink vary over time. Are there any recent trends in cocktail culture that you're particularly pleased with or that particularly annoy you? A. You can get a well made classic drink such as a Martini, Manhattan, Margarita or Negroni in more bars now. Fresh ingredients, proper mixing techniques and once obscure ingredients such as orange bitters are no longer hard to source. The only thing that frustrates me is that many newcomers to the industry are more focused on making drinks than building relationships with their coworkers and the guests. As the novelty of mixology wears off, hopefully priorities will shift back to hosting the party. Q. What are some of your favorite resources for cocktails -- any guides, websites, or other venues that you find particularly interesting, innovative or helpful? A. Cocktail Kingdom: Greg Boehm's vintage cocktail books, international barware and selection of bitters, syrups and obscure liqueurs is a boundless source of inspiration for me. Gary Regan's Ardent Spirits Newsletter is filled with timely information about events, promotions, competitions, etc. Liquor.com has interesting features geared towards consumers. Imbibe Magazine out of Portland and CLASS magazine from the UK are the two best magazines dedicated to the cocktail bar business. Q. 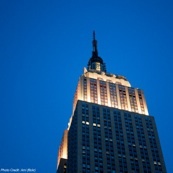 Where are some places you like to eat and drink in New York? A. Maialino, Momofuku Noodle Bar, Back Forty. I eat Motorino probably three times a week. They deliver my pizza (pauses; smiles) to my house, so that’s pretty sweet. At Back Forty, I order the burger a lot, and they have an amazing trout dish right now. It’s great local American food. Ironically, at Noodle Bar, I usually don’t go for the noodles. They have such amazing small plates. When my wife Valerie and I have a special occasion, we love to dine at Eleven Madison Park and Marea – which I have a lot of fun at; and Gramercy Tavern, where I used to bartend. Q. And outside of NYC? A. Cochon in New Orleans, Animal in LA, Hot Dougs in Chicago, No. 9 Park in Boston, Slanted Door in San Francisco. Q. Cocktail bars you think of outside NYC. A. Drink in Boston, Violet Hour Chicago, Cure New Orleans, The Varnish in LA, Florida Room in Miami, Rob Roy in Seattle, and Comstock Saloon in San Francisco, are some of my favorites in the US. Q. Last question – which isn’t really a question, but more of a required confidentiality: when I first met you, over fourteen years ago, you could do one-thousand push-ups a day. How many can you do now? A. I think I can still make that happen :). More Jim Meehan recommendations for what to drink and where to eat, drink and shop in New York, Boston, Chicago, Miami, New Orleans, San Francisco, Los Angeles, and Seattle. Photography by David Engelhardt for Find. Eat. Drink. Copyright ©2013 Find.Eat.Drink. LLC All rights reserved.